BreathGuard is our treatment to fight bad breath. It was developed after many years of research and feedback from the patients we treat at our Breath Clinic. First time you use this treatment we recommend adding the Detox Kit. This kit contains products to provide optimum removal of the biofilms that cause bad breath from the throat and "gag" reflex line on the tongue. We also provide a tongue cleaner and the necessary mixing vials and instructions with each order. This study which involved the facilities of BreezeCare Oral Health in Australia, discovered that halitosis (bad breath) is a biofilm accumulation and that the waste products from the bacteria living in the biofilm release Volatile Sulphur Compounds (the smells of bad breath). When a combination of recommended prodcuts were used this biofilm was able to be dramatically cleaned away, thus reducing the bad breath smells. 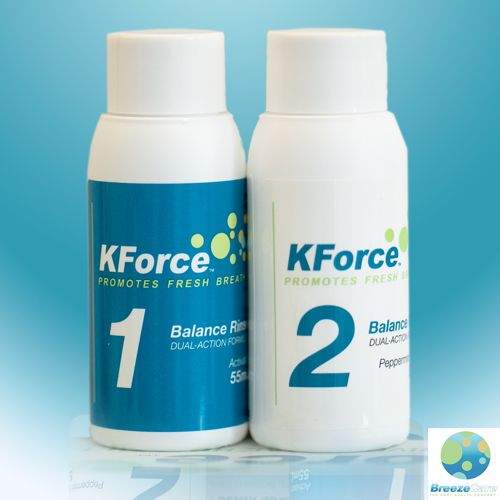 Detox With KForce Menthol Balance Rinse. This is to remove the bacteria causing bad breath (halitosis). The bacteria live on the tongue, teeth, gums and throat. Menthol Balance Rinse is an alkaline oxygenating rinse that is extremely potent. The effectiveness is always at full strength as you mix the two bottles together each time you use the rinse. Our clinic research shows that doing the 5Day morning and night menthol detox is the best way to begin the system. 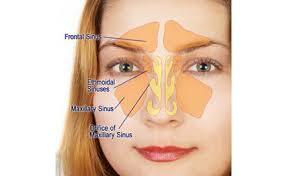 This detox is only needed at the very beginning of treatment and occasionally every few months. Otherwise,the Balance Rinse (in strong or mild flavours) is only necessary twice a week to maintain the status quo of the mouth. Clean With KForce Gel and Paste. This is to remove the biofilm where the bacteria like to feed. This biofilm is high in proteins that break down to smells of bad breath (Volatile Sulphur Compounds). It takes roughly twelve hours for these compounds to build up. So you need to do this cleaning twice a day. The only way to get to the back of the tongue (gag reflex) is to use non-foaming and nonabrasive cleaning gels. KForce Tongue Gel and/or KForce Toothpaste were designed specifically with these cleaning qualities in mind. 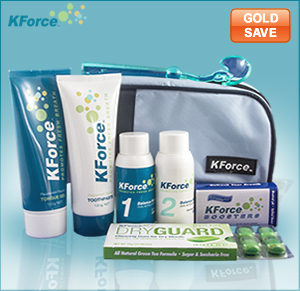 Defend With KForce Oral Boosters. These are potent booster mints that each contain xylitol as the sweetener. Studies show that 6gm of Xylitol every day can help maintain a good bacteria mix in the oral cavity. Each mint contains 30mg of xylitol. I have been using KForce for over three years. My bad breath was first known from colleagues and my wife. I just used mouthwash thinking it would help but it actually made it worse. I took gums and mints every day, but it did not help. It was very embarrassing. Then I saw you guys on Today Tonight and my eyes just lit up. I could not wait to get my hands on your products. I started of with the BreathGuard Starter Kit and I was astounded that it worked literally overnight. It was like I struck gold. Since then I have been using the Toothpaste tongue gel and Balance Rinse. This embarrassing problem has been defeated and I am so happy. The service has been great. I order and I quickly get my products. Thank you so much. KForce Tongue Gel: Sorbitol, Hydrated Silica, Purified Water, Xylitol, Glycerin, Peppermint Oil, Sodium Methyl Cocoyl Taurate, Xanthan Gum, Potassium Pyrophosphate, Zinc Gluconate, Propolis Extract, Sodium Fluoride, Sodium Pyrphosphate, Sodium Citrate, Citric Acid, Sodium Benzoate, Sucralose, Aloe Barbadensis Gel, Grape Seed Extract. 100gm net. 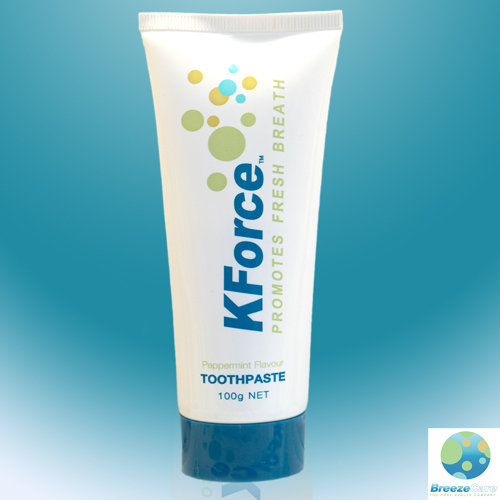 KForce Toothpaste: Purified Water, Sorbitol, Silica, Potassium Nitrate, Glycerin,Xylitol, Sodium Bicarbonate, Peppermint (Mentha Pipenta), Methyl Cocoyl Taurate, Titanium Dioxide, Xanthan Gum, Sodium Fluoride, Sodium Benzoate, Sucralose. 100gm net. 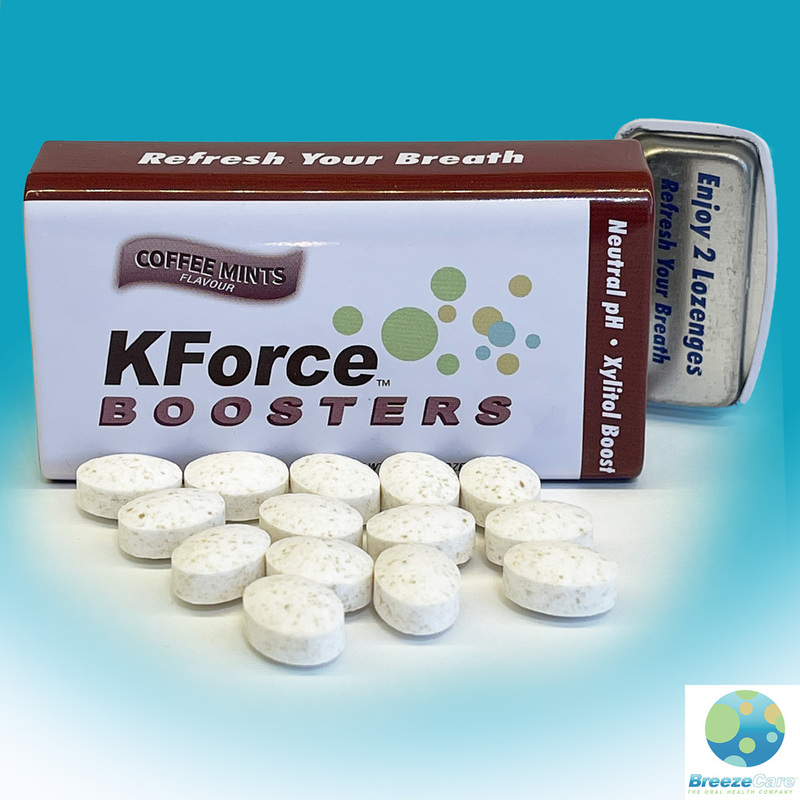 KForce Oral Boosters: Sorbitol, xylitol, freshener, natural peppermint flavour, sucralose, sodium bicarbonate, anti-caking agent. Tin 50pcs.